We Can Come Out And Clear Your Drains Up. Clogged drains happen all of the time. Sometimes it’s because of food that has accidentally been put down it. Other times it could be hair or a build up over time. No matter what the cause of a clogged drain is, All About Plumbing & Septic will be there to help you. When you have a clogged drain, it can mean that there is just one spot that has a clog, but if there are other signs accompanied by a possible clog, it could mean that there is a clog in your main line. It is important to know the signs of a clogged drain and then be able to tell if you can get the clog out on your own using a few simple techniques or that you should call a plumber. If you ever find yourself with a small clog, for example, your shower gets clogged up, there are a few things you can try to do at home before a plumber is called. One of the things you can do is to use a metal rod of some kind or if you have your own drain snake at home, use that to pull the clog out. Even if you are only able to get part of it out, it will be helpful to let the remainder of the water flow down. You can also use chemicals that are bought at the store and are able to work in a way that will dissolve the clog. You need to be careful using these though and you may want to give us a call before you use them because some of those chemicals can do more harm than good. Sometimes the clogs are very difficult to get to on your own and you will need the help of a professional plumber. We are here to help you in any way that we can and unclogging drains is something that we do best. Our plumbers are top quality and have many years of experience with this type of service. When you have a clogged drain in Mills River, Hendersonville, and Asheville, NC, make sure that you give us a call at 828-778-2425 so that we can come out and get it taken care of for you. Putting things like oils, rice, pasta, and fat, down a drain, will cause you to get clogs a lot quicker than any other way. The reason you don’t put starchy foods in drains is because when they get wet, they will expand and cause the pipe to become blocked. The reason you don’t put oils or fats down the drain is because they will stick to the inside of the pipe and it will grab onto anything that tries to go down. A tip that we recommend is to put a screen or cover over the top of the drain. This will help to keep unwanted food and hair out of the drain. Shower and bathtub drains get clogged all of the time because of hair and if there is a cover on it, that can be stopped. Also, use your garbage disposal only when you have to. Try your best not to put any food down it and just use the trash. Once you get into the habit of this, it will become second nature to not use your garbage disposal. Clogged Sewer Lines Can Cause Backup Issues. Knowing the signs of a clogged drain is so important. Once you know what the signs are, you will be able to get the clog taken care of right away and sometimes stop major damage from occurring. If you notice any of these signs, give us a call at 828-778-2425, and we will be able to help you. Backups – If your water starts to backup out of your sink and faucets, it could be because you have a large clog. This usually means that your main line is clogged up and will need to have hydro jetting done to it right away. 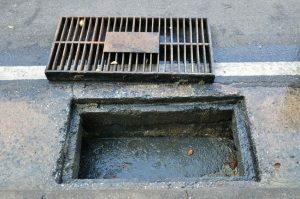 Drains Slow – When water drains down very slowly, it is because it is not able to go down the drain due to a clog. You may see some kind of bubbling in the drain as the water goes down as well. You can try to use a metal rod to see if the clog is close to the surface level. Bad Smell – If your drain smells rotten, it is probably because there is a clog that is down there full of old food and bacteria. These kinds of clogs are frustrating because they are too far down for the garbage disposal to help, so you may need to call a professional to pull the clog out for you. If you have a clogged drain in Mills River, Hendersonville, and Asheville, NC, make sure that you call All About Plumbing & Septic at 828-778-2425 so that our professional plumbers can get your drains running smoothly again right away. 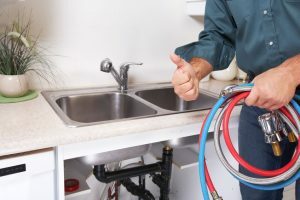 Updated on February 18, 2019 at 10:13 am by All About Plumbing.